You can now repair all kinds of heavy, medium and light machinery right on the job site, in the shop, in the garage or wherever the broken-down parts happen to be. The Portable Boring Bar is a must for the manufacturing of machinery or parts which are difficult to handle by conventional machines. 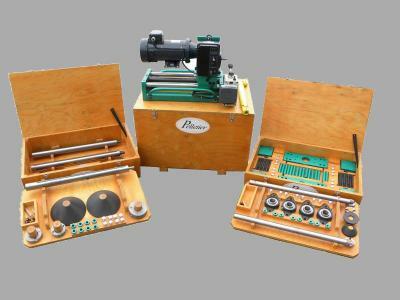 The Portable Boring Bar is the state of the art tool for boring of ball bearing housing and for precision alignment of pins. 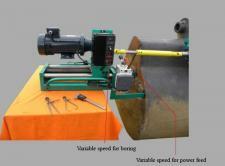 The operations of Portable Boring Bar require little skills or training. The technician-salesperson will provide all the information you need to use this machine. This machine can bore inside diameter holes from 1 1/2" to 7 1/2" with high precision, perfectly aligned and parallel one to the other. 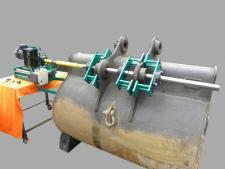 The machine and accessories are sold in 3 solid plywood cases for more facility to the job site. Speed : 0 to 350 R.P.M. 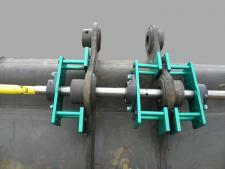 Boring travel length : 14 1/2"
Add boring bar, section of 24" for indefinite length.